Court for Abuja on Monday troway di case wey Bauchi state Govnor Muhammed Abubakar file make Nigeria election office stop to count and announce results from Tafawa Balewa Local Goment Area. Justice Inyang Ekwo say di court no get power to judge di matter. Independent National Electoral Commission bin no fit complete Saturday extra election for di state sake of dis court order. 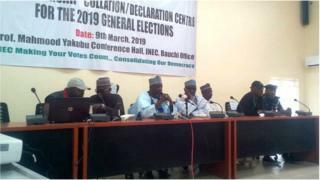 Collation of results don end for Bauchi state, North East Nigeria and di Peoples Democratic Party govnorship candidate Bala Mohammed dey lead wit 6376 votes for di result of di re-run election wey happun on Saturday. Im closest rival and di current govnor of di state Mohammed Abubakar of di All Progressive Congress (APC) dey im back wit 5117 votes. But di returning officer for di state Prof Kyari Mohammed say im no get power to declare di winner yet because result from Tafawa Balewa local goment area neva ready.